My friend and his wife visited UK during the year 2015. And they came back on time we want to know one information as they same couple want to visit UK again For how many years or months can multiple entry visa can be given for a couple who have already visited UK? For how many years or months can multiple entry visa can be given for a couple who have already visited UK? The Standard Visitor Visa can be issued for lengths of 6 months (the normal case), two years, five years, and ten years. Regardless of the length, the person must leave the UK such that they are never in the UK for longer than 6 months on any visit. They must also satisfy the Immigration Officer on each visit that they will not live in the UK for extended periods through frequent or successive visits, or make the UK their main home. the applicant can show a performance history or otherwise demonstrate their bona fides. Motivation. The applicant can enjoy a slight savings on visa fees and and the lead time for planning visits can be reduced. Sometimes, for a given flight, LHR or LGW may open a dedicated queue to help ease congestion. Example. The last one I represented personally was a semi-retired grandmother (stable personal circumstances) whose grandson was a born and bred Brit (good premise for repeat visits) and who had been visiting her grandson on 6 months visas for the previous 8 years (performance history). There was also a balanced history of both sponsor (the grandson) and applicant (the grandmother) travelling to visit each other. The Entry Clearance Officer likes to see a combination of things like that. In this case the grandmother got a 10 year visit visa. They also like to give them to business visitors who can meet the same general requirements. 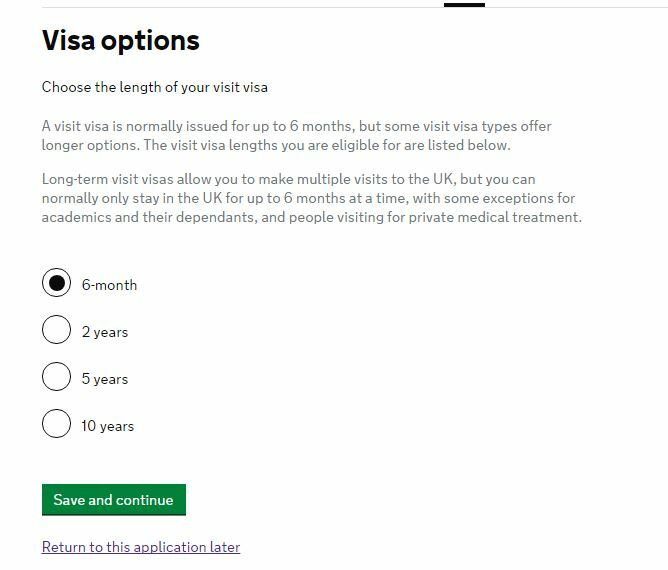 I have also seen cases where the ECO noticed that an applicant asked for a 6 month visa but met all the above requirements and so the ECO issued a two/five year visa (and UKVI 'ate' the fee differential). Example. A Russian woman was in a long-distance relationship (LDR) and had 3 back-to-back visitor visas in a row. On her 4th application, the ECO noticed that everything seemed in order and issued a two year visa with a verbal advisory that next time she would need to pay the full fee for a two year visa. Downside. The fee for a 10 year visitor visa is slightly more than GBP 800 (or about 9 times the fee for a 6 month visa). If the ECO thinks the applicant doesn't qualify in one of the requirements above, she will issue a 6 month visa and keep the difference in fee. It means the applicant has paid GBP 800+ for something that costs GBP 87. Any applicant can ask for a length of 6 months, two years, five years, or ten years and pay the appropriate fee to have their application considered. The decision-making criteria is not published and there is downside risk for the applicant.